I recently returned from a very productive trip to Portland, Oregon for the Foundation for Religious Diplomacy. In my work with the Evangelical Chapter, I have not only been building that up as chapter custodian, but also serving as a master custodian, providing help to people of goodwill in other religious traditions who are as deeply committed to their religion as I am to Christianity. I am helping them build their chapters so they can prepare their religious communities for interreligious engagement in the best way possible. One of the ways this took shape recently was with a trip to Portland. The trip, symbolized by the picture above, was like the opening line to a joke: “Three Buddhists, two Evangelicals, and one Mormon walk into a bar.” Only this story was not a joke. Instead, it is an example of a new and promising way of engaging those in other religions. We traveled to Portland to visit Kyogen Carlson (pictured above, third from the right), a resident teacher who leads the Dharma Rain Zen (Buddhist) Center. Kyogen and his wife and co-abbot Gyokuko (second from right), will be working with a growing network of Buddhists to form the Buddhist chapter of FRD. I traveled with FRD founder and president, Charles Randall Paul (in the center of the picture), and we stayed at the monastery and discussed various aspects of chapter formation and interreligious relationships with the key elements of civility without compromise. 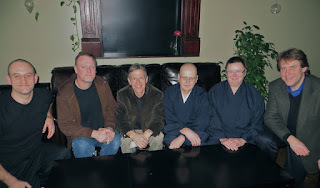 Ejo McMullen of Eugene (first on the left of the picture) was another Buddhist and part of this discussion. We finished the day with a lunch, and Paul Louis Metzger (first on the right), who is a professor at Multnomah Biblical Seminary, and who is a charter member of the Evangelical chapter and a Senior Fellow for FRD. During lunch we had an amazing discussion about our mutual desires to see greater religious freedoms in the public square for religious discourse, but without the animosity we often aim at each other. We also discussed our mutual desires to see the others embrace our faith perspectives.